If you are running SCCM 1810 in your setup, there is a new hotfix KB4488598 available. Microsoft released KB4488598 hotfix just a week ago. However this update applies to customers who opted in through a PowerShell script to the first wave (early update ring) deployment. It is also applicable to customers who installed the globally available release. 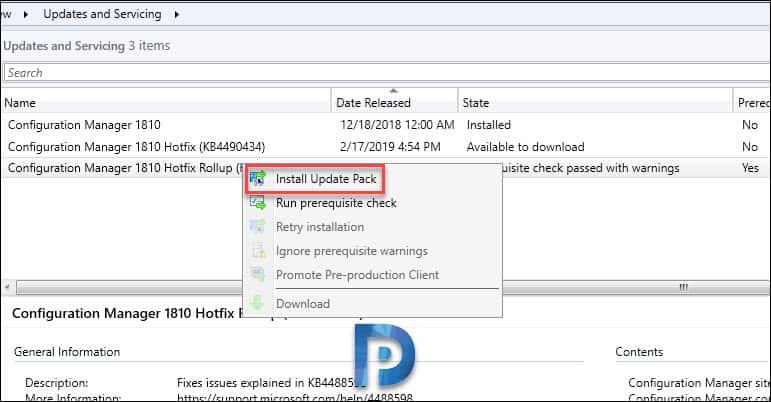 The SCCM 1810 update rollup 2 includes the below hotfixes. 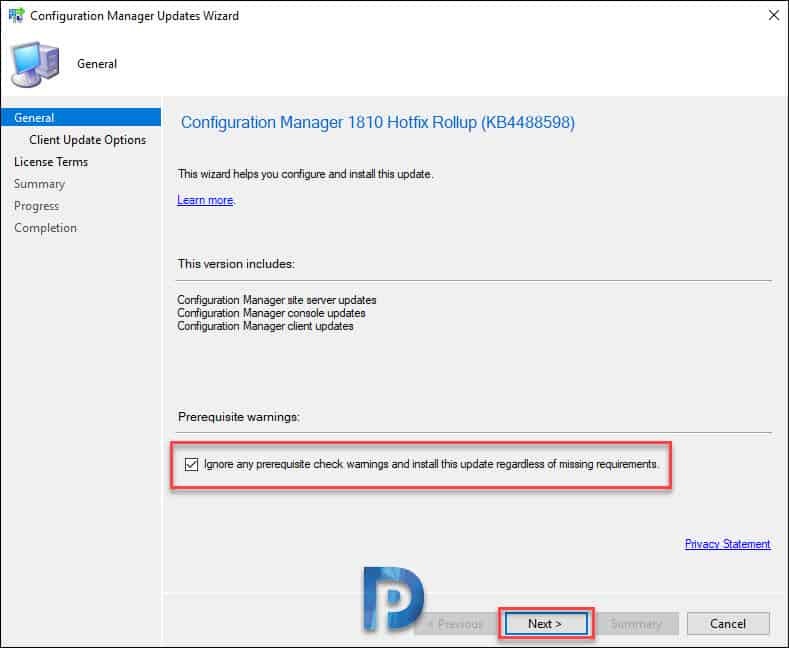 Click on each link to know more about SCCM 1810 hotfixes. If you haven’t installed any SCCM 1810 hotfixes so far, then you can directly install hotfix KB4488598. 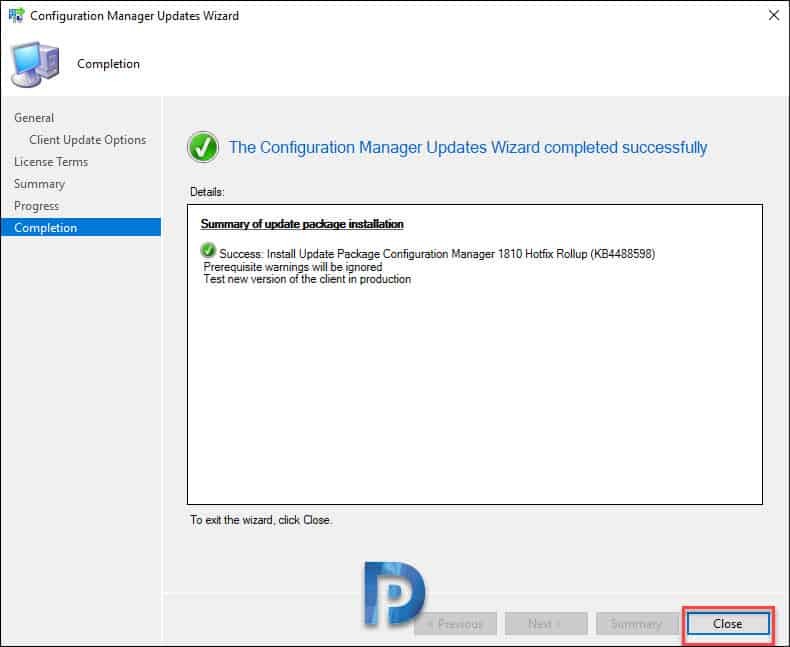 KB4490575 – This hotfix fixes the issue where update installations stop responding or never show completion status in ConfigMgr 1810. KB4490434 – Addresses issue with duplicate user discovery columns are created in SCCM. 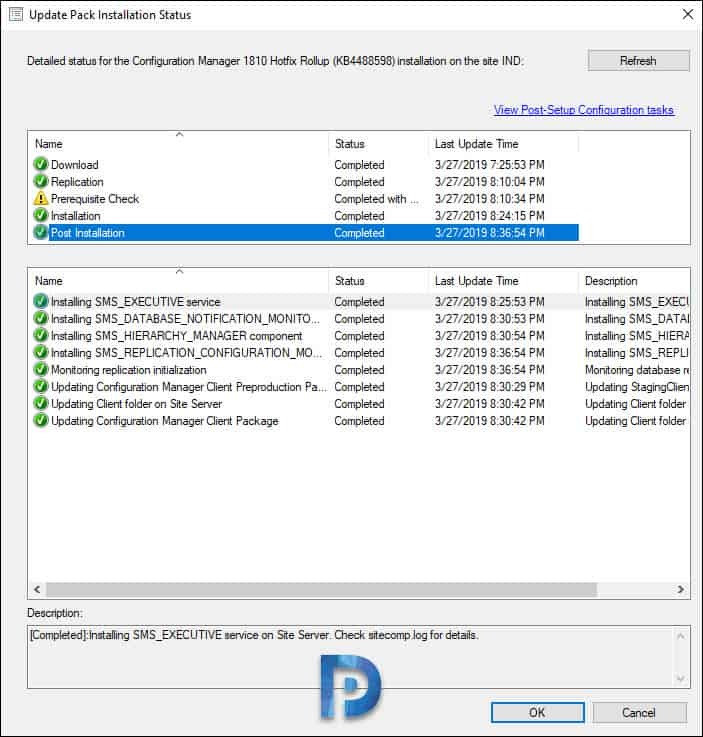 Hotfix KB4487960 – Fixes issue where Microsoft Intune connector certificate does not renew in SCCM. Before we install hotfix KB4488598, I would like to perform prerequisite check first. This is because I had seen lot user comments who experienced prerequisite check warnings while installing SCCM 1810 hotfixes. We know that with SCCM 1810, the prerequisite check is more resilient. Warnings can be ignored but not errors else they might halt the hotfix installation. Here are two guides that would help in-case you see any warnings or errors while installing SCCM 1810. In my lab setup, when I did a KB4488598 prerequisite check, i found just one warning. Potential SQL server performance issue caused by change tracking retention period. 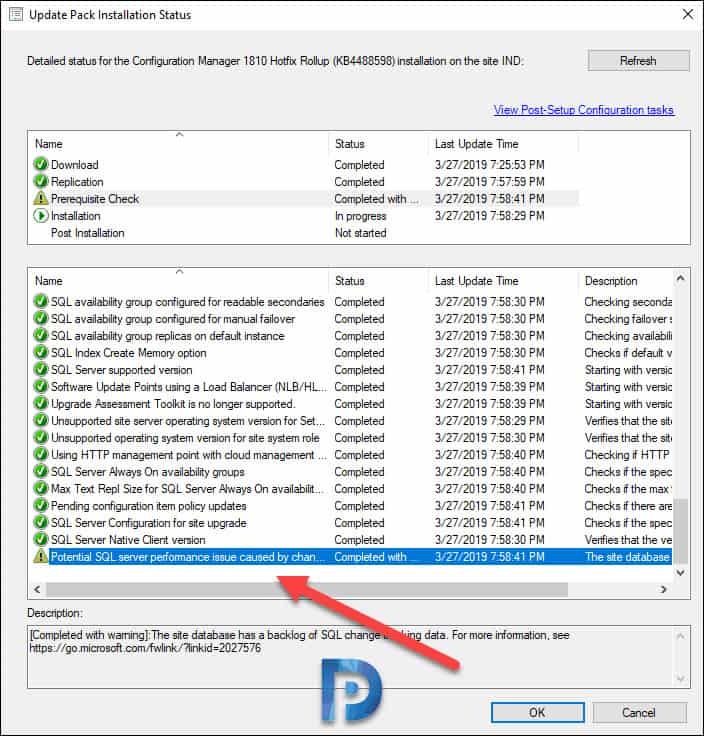 Warning – Configuration Manager detects the site database has a backlog of SQL change tracking data. This warning can be skipped as it doesn’t halt the installation. I chose to skip this warning and install the hotfix. However I recommend prerequisite check to be done before installing the hotfix. Navigate to Administration > Overview > Updates and Servicing. 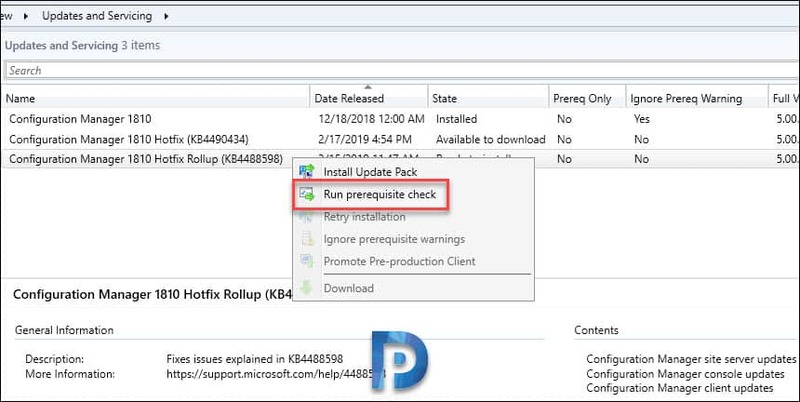 Right click Configuration Manager 1810 Hotfix Rollup KB4488598. Click Install Update Pack. 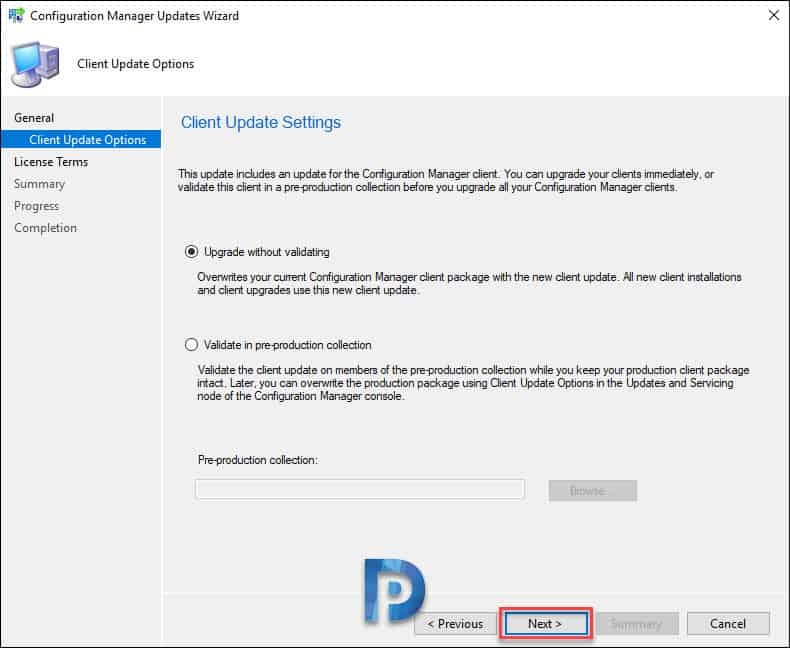 Configuration Manager client and console updates. At this step, I chose to ignore the prerequisite warnings and click Next. If you are installing this hotfix in prod, it may be good idea to first validate client update on clients which are part of pre-production collection. Click Next. Go to Monitoring section and right click the hotfix rollup and click View Status. That should show the hotfix installation progress. The hotfix contains updates to console. Hence you will see the console upgrade window. To install the new console version 5.1810.1075.2600, click OK. 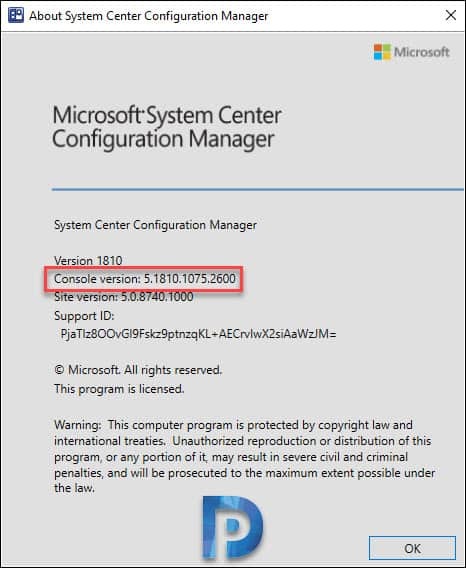 Check the About System Center Configuration Manager. You should see the following details. Note – If you have enabled auto client upgrade under hierarchy settings, the clients agents will be upgraded to the latest version 5.00.8740.1042. Prajwal…upgrade was completed successfully per your instructions. Where is the updated console file stored if I want to create a package to deploy? Thanks for the quick reply! I’ve gone to the link you provided. I already have an existing package for the console but this is for the initially installed version, 1802. I need to create a new one with the console for 1902 but when I go to the site server and looked inside Tools>ConsoleSetup, I don’t see the newer one. Where would the new files be located after I performed the In-Console updates from 1802 > 1810 > 1902? For prereq check – You can go to monitoring > right click update and check status. You will get to know at what step is it stuck. You can also check ConfigMgrPrereq.log file on the system drive of the computer. If there is any error that you see, post it here, we will try to fix it. The SYSTEM account was missing from the folder Properties Security tab and I had to add it back. I have also discovered that the LocalHost\Administrators and LocalHost\Users accounts were missing from the root software source folder in the Security tab. Next to the application of the patch, we have hudge problems with package downloading (no problem before). On a TS, it applies WIM image but next it can’t get the other packages. No logs on the PXE/DP server with errors. Any errors in appenforce.log/execmgr.log file ?. Stuck in installation after “Extract Update Package” with error. Any idea what is causing this or how to solved ?